There's a lot going on in Little 5 Points and you can be a part of it! Get your name on a paver in Findley Plaza or adopt an item in Little 5 Points to help in the beautification effort. Read the latest update below to find out more! The IPNA Meeting will be held Thursday, April 18, 2019, 7:30 pm at the Trolley Barn. Please note, our meeting is not being held on Wednesday this month. We voted to move the meeting too Thursday to accommodate a Trolley Barn booking. 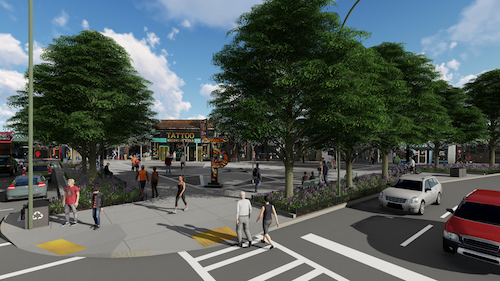 The Inman Park Neighborhood Association Meeting is Wednesday, March 20, 2019, 7:30 pm at the Trolley Barn. The meeting agenda is listed below. All are welcome and encouraged to attend. Coming to a meeting is the best way to find out what's going on in your community. There are new rules for personal golf carts during Inman Park Festival this year. Personal Golf carts will not be allowed in the festival footprint during festival hours. They may park nearby. The only exception is Butterfly Ball. Personal golf carts will be allowed near the tent Friday night. Below is a map that details where personal golf carts will be allowed Saturday and Sunday. The March Porch Party is Friday, March 29, 2019 at 7:30 pm. Our hosts are Ann and Jeff Cramer at 1054 Austin Ave. All are welcome! Bring your drink-of-choice and an appetizer to share. We'll see you there! Funding for RenewAtlanta projects are in jeopardy. The city has a "Prioritization & Rebaselining Initiative" on their website. There isn't enough money for all the projects to be completed. We'll have to fight for ours and we'll need your help. For several years our Transportation Committee, headed by Janice Darling, has been working with Renew Atlanta on two projects in the neighborhood. The N. Highland safety improvements from N. Highland to Alaska Ave. and the Euclid and Edgewood intersection. Both projects have met neighborhood approval and the plans are complete. They only need funding. both plans include bike lanes and crosswalks. The N. Highland one also include loading zones, increased parking and ride share pickups. These safety improvements are part of the complete streets project with Renew Atlanta and are greatly needed. Anyone who has tried to cross N. Highland at Barcelona knows we need safety improvements along this very busy area. Two rounds of public engagement meetings will be held. One is this Wednesday, January 22, 1019 from 6:30-8:00 pm at Grady High School and the other one is Thursday, March 7, 2019 from 6:30-8:00 pm also at Grady. The more people we have at these meetings supporting our N. Highland Complete Streets Project the more likely we are to get funding. The city needs to know we want and need these improvement done. 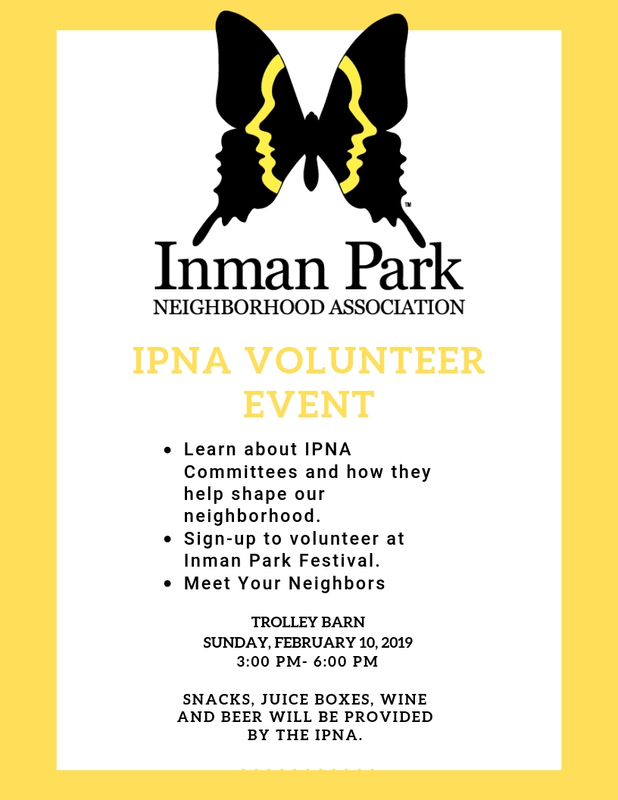 The Inman Park Neighborhood Association Meeting will be held Wednesday, January 16, 2019 at the Trolley Barn 7:30 pm. All Inman Park neighbors are welcome. The newly formed Little 5 Alliance is now forming committees that will work on improving Little 5. Sign up now. The IPNA will vote on edits to the Moreland LCI Study at the IPNA meeting on Wednesday, December 19, 2018. Please take the time to read the study before Wednesday's vote. Here is a link to the edited study. Included for reference are the links to the Moreland 5-year plan and the Ponce/Moreland Study. These additional links are included for context in case you want to further know what's ahead for Moreland. Please feel free to comment below on the plan. Janice Darling, head of the IPNA Transportation Committee, is meeting with the city to offer our input and finalize plans. The Inman Park Neighborhood Association meeting will be held Wednesday, October 17, 2018, at the Trolley Barn at 7:30 pm. We also have a pre-meeting at 6:30 pm on the Little 5 Points Moreland LCI Study. We'll answer questions and further discuss the study group amendments to the original report.